AMOUNT OF PRODUCT: 1 oz. PACKAGING: It’s packaged in a clear glass jar with screw-on top. SIZE: A little bigger than a golf ball. CONSISTENCY: Creamy and extremely pigmented. SMELL: No scent or perfume. INGREDIENTS: Aqua (Water), Cyclomethicone, Butylene Glycol, Cetyl Dimethicone Copolyol, Dimethicone, Peg-350, Sodium Chloride, Silica Dimethyl Silylate, Glycerin, Rosmarinus Officinalis (Rosemary) Leaf Extract, Laminaria Saccharina Extract, Natto Gum, Camellia Sinensis Leaf Extract, Aloe Barbadensis Leaf Extract, Chamomilla Recutita (Matricaria) Extract, Arnica Montana Flower Extract, Oryza Sativa (Rice) Bran Extract, Phenoxyethanol, Methylparaben, Propylparaben; May Contain: Methicone, Stearic Acid, Aluminium Hydroxide, Silica, Iron Oxides (CI 77491, CI 77492, CI 77499), Talc, Titanium Dioxide (CI 77891), Mica (CI 77019). An oil-free gel foundation that has the unique ability to transfer water into the skin without the use of any oil. The formula provides adjustable coverage (medium to full) thanks to light-reflective circular pigment that eases the appearance of flaws. 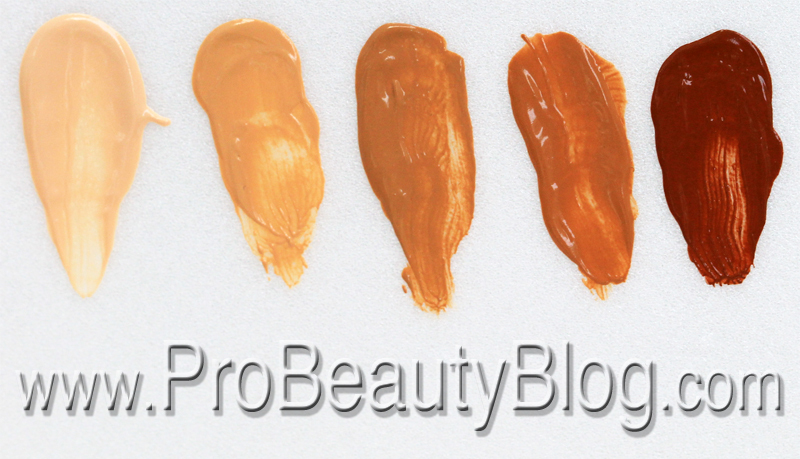 Shades (from left to right): Porcelain, Camomile, Sand, Banana, and Carob. 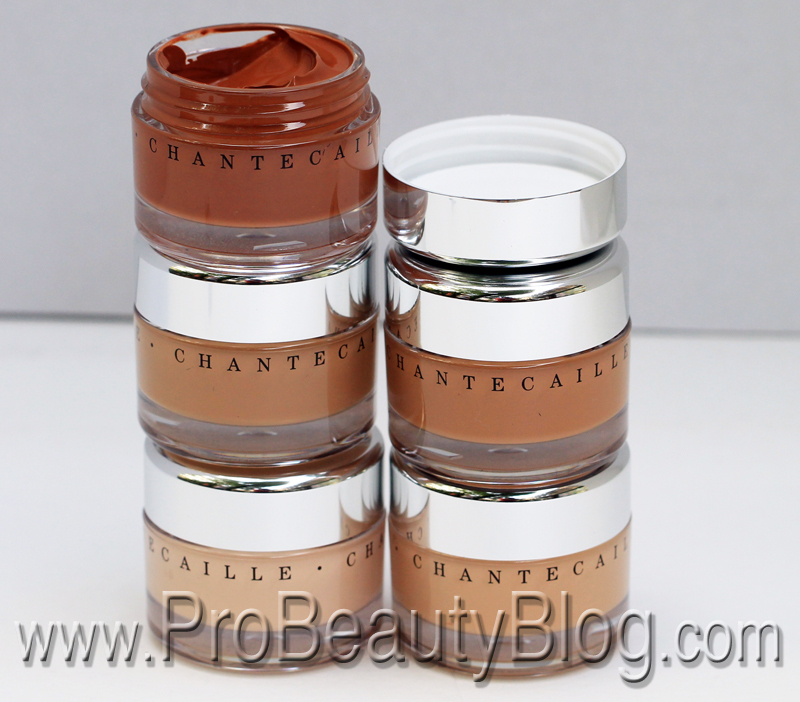 When you purchase a Chantecaille product, you are expecting LUXURY… and this Future Skin foundation does not disappoint! The foundation is absolutely beautiful in every possible way. Let’s start with presentation. The packaging screams luxury! The product comes in a petite plastic jar, with a chrome-like plastic lid. Now, I know you’re rolling your eyes at me, because I just said the word “plastic,” but hear me out. If you are observing with only your eyes, you would swear that the packaging was, in fact, glass and chrome; and although that would be beautiful to look at, it would be absolutely DREADFUL to carry in my kit! This is one of the few foundations that I will not need to de-pot due to an obnoxious size or weight. Isn’t it nice when your clients can feel special because they see a beautifully-packaged jar of Chantecaille foundation waiting for them? On to performance! I would not recommend this foundation for someone with problematic skin, in need of heavy coverage. Although this is marketed as a medium-to-full coverage foundation, I find it to be a lot more in the “medium coverage” range, than in the “full coverage” range. You’d have to use a lot of layers to get an opaque coverage. 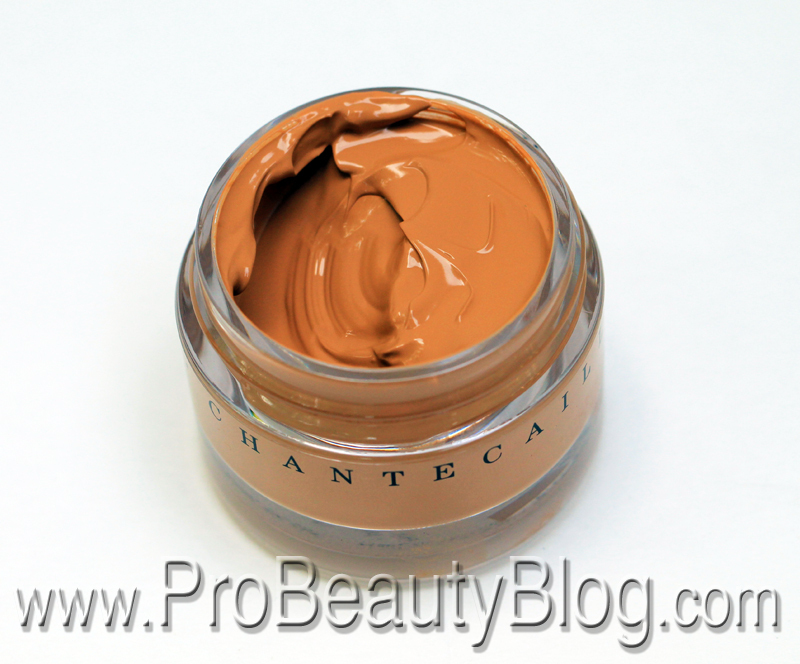 This foundation is brilliant for people who need to even-out and revitalize their complexion. The foundation slips on the skin, almost like a moisturizer. It melts in effortlessly, and has a “weightless” feeling when on the skin. I would say that this would work best when applied with your fingers, and massaged into the skin. When you use that technique, the foundation is undetectable.